France fell to the Nazi army in a matter of weeks and as with all wars to the victors go the spoils; and in this case that meant one of France’s cultural symbols; its wines. 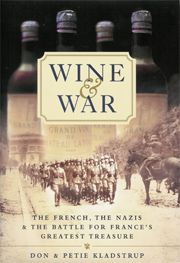 This wine book is a collection of tales from the myriad of personalities wrapped up in the drama of war but ultimately tied together through their connection to wine. Follow the thrilling escapades of the freedom fighters sabotaging German attempts to confiscate wine, the tiny acts of bravery exhibited every day in the face of German occupation, and the clever ruses designed to hide the most precious of treasures. Witness what people will do in order to keep their businesses alive, cooperating with the German forces and eventually being tried for treason after the war. Witness the kindness and respect exhibited by some Germans who undoubtedly get the worst rap in this book. And finally be touched by the joy a simple tasting of a few bottles in a POW camp can bring when shared by like minded souls under the turned eye of their occupiers. The anecdotes in this wine book range from thrilling to touching and are a highly entertaining read. However, the book could have done much more with the subject matter and it ultimately lacks credibility and judiciousness in its account. Lending a more scientific approach could have done the topic more justice, but still it is worth the read given the compelling new light it shines on an otherwise much chronicled period of history.